I work with mixed media in all styles invented so far (classic, art nouveau, Gothic, and so on), so it would be impossible to describe my work as a particular artistic style. I love to make a variety of different things. Virtually everything around me: nature, people, art created by others, images, sounds, and smells. I look at a bottle of Green Mint shampoo, and I see a perfect necklace. I really enjoy working with any materials I can get my hands on! I am totally a kinesthetic person, so I enjoy immensely feeling some texture under my fingers. I love to work with polymer clay because with this amazing medium I can give life to all fantastic beings, plants, and stones which before could exist only in my imagination. I love working with gemstones because they are truly the fruits of underground gardens. They are so alive, each has its own voice. I like to work with seed beads because they are so delicate and elegant. I don't do embroidery though; I simply don't have eyesight good enough for that. Instead, I do a lot of bead weaving and enjoy it very much; I should probably have been born as a spider because I am always weaving something, developing my own patterns and techniques. I also like to work with wire since it's another very versatile medium which can be turned into many different things. I love working with pearls; there aren't many things more beautiful than they are. I have always loved the sea and ships. I can walk or sit on the beach, like a lunatic, for hours watching the waves, collecting shells or looking at ships. I love to swim and I love to sail. Seas are one of the most wonderful things in this world. I am also fascinated by the old civilizations, especially the Etruscan (Rasennian) one. 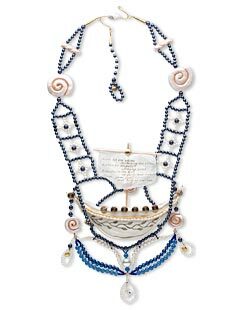 The ship in the necklace is a model of a Etruscan ship; such ships were crossing the Tyrrhenian Sea in 1200-550 BC. Ships were so large and heavy that they often had to stay away from the shore for a few days and even weeks waiting for the tide high enough to let them moor. The one in the necklace isn't such a size; nonetheless, it's an actual ship. If separated from the necklace and put into water, it can sail; you'd only need to blow into the sail. I was coming back from a business trip to Pennsylvania with my husband. It was already late and quite dark too. I was reading the catalog I received with my first order from Fire Mountain. I was straining as hard as I could see the letters; after a while I had to put it down (we were driving on Pennsylvania Turnpike which has its name for a good reason; the road goes in mountains and unless you know how to fly, it's better not to distract the driver by turning on the light or doing other foolish things). There was information on Pearls and the Kato Polyclay Contest in the catalog. Somehow I kept thinking about it, sitting in the dark. Suddenly I heard waves breathing under the stars and a faint melody, like somebody was playing a harp. The melody turned into words. Hurriedly, I snatched my notepad I always carry with me and wrote the words down. The bright light of an idea came into my head. In the dark, I sketched the design as best as I could. Later, at home, I made a detailed drawing, defined the supplies, ordered them, and started to work. It took me four tries to make the ship, but I did not give up. The clay was too pliable to sculpt such a large thing; it wouldn't keep the shape. Finally I came up with an idea to build the ship around a foil mold, just like handmade dolls are created. I could also use prebaked clay as a mold, but that would significantly increase the piece's weight and make it hardly wearable. I made polymer clay shells and spacer bars, created a clasp with a real shell, and strung all parts together in a pattern as much resembling moving sea waves as I could manage. The work was done--and, voila! The ship set sail (to the Fire Mountain contest). I've been making some sort of craft since I figured out how to get out of my boring cradle. I was a very quiet kid; I was always sitting in my corner making crafts. Adults would pass by, look at me and say: "Oh, this kid is way too quiet! She's up to no good!" Only I knew what I was up to--anything creative. Later I started repairing, restringing, and remaking my Mom's jewelry. I still remember my delight when my mom's large wooden necklace broke--because I could use the beads! I erased the paint, attached beads to wooden thread bobbins, decorated them--and many little dolls came to life. My friends always liked to come and play with the doll houses I was making inside large shoe boxes. Once I found my Granny sitting under the table playing with the doll furniture I made. When I was a teenager, I was making jewelry for my friends and myself. I also loved to make creative gift wraps, very personal for each one; I would start working on Christmas gifts in the mid-summer, so everything was ready on time. Most people would save the wraps together with their gifts, and I liked it because I have always treasured a chance to share my creations with others. I introduced myself to beading. I do not have any formal training whatsoever. In fact, I have a law degree. I am completely self-taught. When I say "self," I mean it. I did not learn from books or classes; in fact, I have never read a book on beading or taken any classes. I think I should, though. All the things I've learned were the results of pure experimentation. I love experimenting. I sit at my work table, turn off my brain and let my inspiration, my hands, and the material I am working with guide me. I listen to the voice of the material; it always tells me what to do. My mom used to have very creative friends--artists, sculptors, poets… I did my best to learn from all of them whatever I could. That's another thing I love to do--learn something new. I like to watch videos online dedicated to the creation of different crafts. I shouldn't say "crafts," should I? Many people get offended by that. They say: "I don't make crafts! I create art!" To me "crafts" are everything creative. Fire Mountain has some really good video tutorials on its website. I have watched them all; it was very interesting. When I decided to make and sell craft (this word again) professionally, I did vast research and found a few thousand beading/art suppliers all around the globe. I noted Fire Mountain for a wide selection, reasonable prices, and a very well-organized website. In addition, all vendors look pretty good on their websites, but it can turn out to be otherwise when you are actually trying to establish a relationship with them. Fire Mountain products were the same as what they looked like on the website--so I started to order from them. I enjoy quite a few of them! I love to knit, crochet, watch movies, travel, take photos of interesting places/things, sing, dance, collect beautiful candles, and skate. Not yet. I just moved to the U.S. a couple years ago, and in my home country I did not sell jewelry professionally. Jewelry-making and craft-making play a very important role in my life. In fact, I can't live without it; it's stronger than me. I physically suffer if I am parted with my crafts, tools, and materials; I need to work on something virtually every day. It is a great joy, satisfaction and happiness to able to share a piece of myself with other people. Jewelry-making used to be a hobby and then a part-time career, but now I feel I need to move on to it completely. Law and craft-making are two things I like to do for a living; the time has come to make a choice between the two, and the choice isn't easy. I am starting my craft-making company, Gray's Crafts. Before I used to sell only to the local community where I live. Soon I will open my company's website, www.grayscrafts.com, as well as establish my store on Etsy. I plan to sell through Amazon.com, attend craft and art shows, and sell through specialty retail stores (like bridal shops). In addition, I plan to enter an art studio contest, so if I win, I'll have a nice studio (you can't just rent in this place since it's in a very good tourist location; you only get a studio if you win the contest). I think I will always enter contests since it's not only fun, but also a challenge allowing to explore and overcome limitations for my creativity. Currently, I've made some beads to be sent to the Circle of Hope program. In the past, I've made things for the charity auctions. I give to the Make A Wish foundation. I donate pet food to Alexandria Pet Shelter whenever I can. I like to bring food to the soup kitchens, so the hungry can eat. To me, the best way to do charity is through personal participation. if you just give money to the people who never had it, most likely they will spend it on something they don't really need. I think a better way is to come, talk to people, get to know them, and then go out and buy goods/services they need. Work hard on your craft. Don't get desperate if the craft gets totally messed up. Try to rescue what you can or start over. Don't do a dirty job; you'll be the first who'll dislike it. Always try to learn new things and challenge your creativity. Love your creations and give them all of yourself--and they will come alive. Don't be afraid to experiment; if you burned down your working table using that new torch you've got--well, now at least you know how to use the torch. Negative experience is still a valuable one. You might want to write down your mistakes in a special diary, as well as the things you've learned from them. Sometimes everything goes wrong. Well, if life gives you lemons, make lemonade! Stop and rethink what you were doing; you might find that you want to do it in a totally different way. Always listen to the material you're working with, as well as to yourself. Don't try to show the results of your work, but the beauty of your idea. Try and find your unique style--and success will come to you. View all of Anna's designs in the Gallery of Designs.